Te’Amir is the storied L.A. drummer and producer who toured with Aloe Blacc and who’s performed with the heaviest of the heavy hitters—Kamasi Washington, Kendrick Lamar, Kamaiyah and many more—and who’s about to release the sequel to July’s striking Abyssinia EP. (Available here!) Now he’s about to release the sequel Abyssinia Rise EP on Tru Thoughts, and here’s the first single: “Blue Nile” is a dubby spacey track more than halfway to some kind of hypnotic electronic song, built with an ebb-and-flow tidal rhythm and a just-so sense for pacing and texture. (If it went on for ten minutes, it’d only get better!) 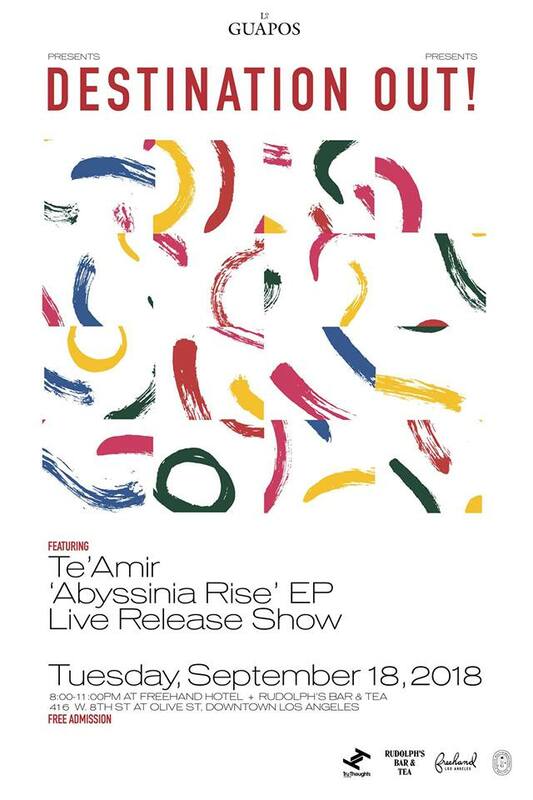 Abyssinia Rise is out Oct. 19, but the live release show is Tue., Sept. 18, at Destination OUT! at Rudolph’s Bar and Tea—flyer below!